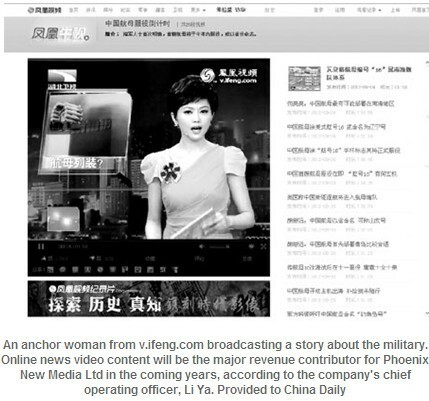 China's online news video market could be one of the few "blue oceans" left for Internet portals. The multi-billion yuan sector is expected to develop substantially over the next few years, said Li Ya, chief operating officer of Phoenix New Media Ltd, the country's fourth largest Web portal by audience viewing. Li said that the company's advertising revenue, which has doubled annually during the last five years, will maintain strong growth this year. But, he refused to elaborate on the exact growth rate. "Online news video content will be the major revenue contributor for us in the coming years. Advertisers have spent about 30 billion yuan to buy advertising slots on television news programs. Online content could get a quarter of that in three to five years," Li said, adding that online news video content is likely to lure roughly 7.5 billion yuan ($1.2 billion) in advertising earnings for the industry. According to Li, online news content is not simply a replay of TV news programs: Interactivity and user-generated content will play a big role in future news websites. He also predicted video advertising revenue would could make up at least 25 percent of the company’s total revenue down the road. Currently, the sector makes less than 20 percent of the company revenue. In the second quarter of this year, Phoenix New Media's total revenues increased by 24.5 percent year-on-year to 283.4 million yuan, driven by a 29.5 percent increase in net advertising revenues and a 19.5 percent increase in paid service revenues. However, the number of advertisers declined by 3.4 percent compared with the previous quarter to 227. "China's continuing macro-economic uncertainty resulted in the second quarter being more challenging than previously anticipated," said Liu Shuang, chief executive officer of Phoenix New Media. Some of the company's advertisers delayed advertising spending as their business growth slowed, he said. The company's flagship website, ifeng.com, has seen a 62 percent year-on-year growth in daily unique visitors in the second quarter, reaching 26.4 million in June. Other major Chinese portals experienced single digit growth over the same period, according to iResearch Consulting Group, a Beijing-based Internet research company. The rate of increase was the highest among all online video platforms, according to Li. "That was because we are doing more jobs than traditional portals do. The website ifeng.com does not serve as an information hub, where an overwhelming amount of stories pile up," he said. "We are devoted to providing more exclusive news content and news stories with unique aspects." The website will also beef up its editing team, Li said, without revealing a detailed plan. In the last quarter, the company's average revenue per user, or total revenue divided by the number of subscribers, hit a record high of 650,000 yuan, an 18.5 percent increase compared with the first quarter of 2012. "The jump in ARPU indicates advertisers' increasing recognition of the value of the website," said iResearch. However, Phoenix New Media’s higher-than-expected business performance did not help to lift its stock price. Currently it is down more than 66 percent compared with its initial public offering price of $11.00. The Beijing-based company was listed on the New York Stock Exchange on May 12, 2011. Late last month, while Morgan Stanley maintained its "Buy" rating, Deutsche Bank downgraded the Chinese company’s ratings to “hold” in fear of advertisers cutting advertising as China’s economy slows. The nation’s gross domestic product growth fell to a three-year low of 7.6 percent in the second quarter. The nation's overseas-listed companies have accused short sellers on Wall Street of issuing false information about Chinese companies to drag down share prices. In late July the company announced it may buy back up to $20 million of its outstanding American depository shares this year. "The current stock price fails to reflect the company’s true value," said Li. He also said the repurchase plan was only a short-term move. "We are focused on daily business executions and strive to deliver solid financial results , which will convince investors about our long-term outlook and value, eventually," he said.